Order your Airbourne 2018 souvenir programme including aircraft information, money saving discount vouchers and advance flying times of all displays at the show. 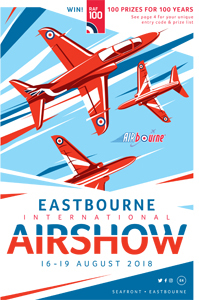 Plus take your copy to the Airbourne Information stand, Seafront Office or any programme seller at the show from 10am each day to obtain free daily flying updates, available only to holders of the official souvenir programme. The souvenir programme costs just £4 +£1.50 P&P. If this is a personal purchase and you are a UK taxpayer*, Eastbourne Tourist Information Centre can increase the value of your purchase without costing you a penny. If you tick the 'Reclaim Gift Aid' box and fill in your full name and home address details, Eastbourne Tourist Information Centre will be able to claim at least 25% extra from the Government on top of your purchase made through Visit Eastbourne. Your name and address will be forwarded to Eastbourne Tourist Information Centre in this case to allow them to claim the Gift Aid. *You must have paid UK tax this year at least equal to the 25% Eastbourne Tourist Information Centre will claim.